Staff members from the UKZN ENT-Head and Neck Department, UKZN Audiology department and those from the Audiology Department at King Edward VIII Hospital (KEH) and Inkosi Albert Luthuli Central Hospital marched to the Nelson R Mandela School of Medicine campus to raise awareness on hearing healthcare. The marchers joined the rest of the World Health Organization (WHO) global family in commemorating the day under the theme ‘Hear the Future and prepare for it’. ENT specialists, Audiologists, Nurses supported by Mr Sthembiso Blose from the Department of Health Rehabilitation and Disability came together with the aim to raise awareness on the rising prevalence, cost, preventive measures and management of hearing loss. ‘According to WHO statistical projections by 2050 almost one in 10 people will be suffering from hearing loss,’ said one of the event’s organisers, UKZN ENT Registrar Dr John Kutsukutsa. 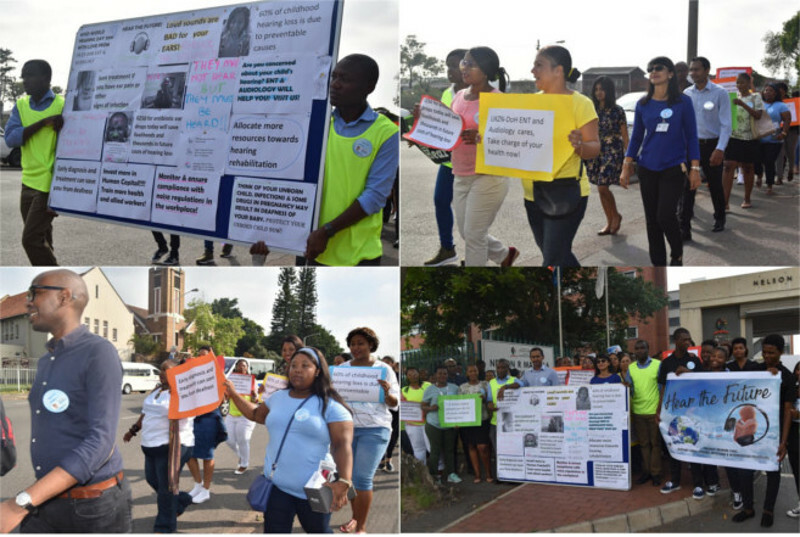 The day started off with a Silent March from King Edward Gate 2 on Rick Turner to the main Medical School entrance on Umbilo Road. ‘Hearing loss brings with it a silent world to the afflicted, our march was highlighting this fact as well as highlighting the main issues and solutions around the problem,’ said Dr Kutsukutsa. Close to 100 people took part in the march that proceeded peacefully and was followed by presentations around the subject. The presentations covered topics such as Preventable causes of hearing loss: noise exposure, infection, trauma, certain medications and the symptoms of hearing loss. Audiology Academic Leader Professor Seema Panday said they were concerned by the rising prevalence of hearing loss, ‘Up to 60% of childhood hearing loss is preventable,’ Panday said.